This chicken salad is great for lunch, either at home or as part of a packed lunch. 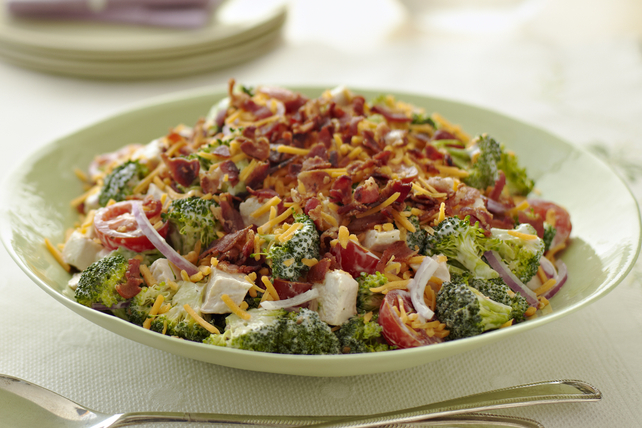 The broccoli adds great texture and the chicken, cheese and bacon ensure great flavour in every bite. Give this Cheddar-Chicken Crunch Salad a try! The trimmings from the broccoli are tasty and edible. Trim the tough ends from the broccoli stalk and reserve for soups and stews. Or, shred for use in coleslaw or other salads. Save 60 calories and 9g of total fat, including 1g of saturated fat, per serving by preparing with Miracle Whip Calorie-Wise Spread, Kraft Calorie-Wise Rancher's Choice Dressing and Kraft Mozza-Cheddar Light Shredded Cheese.